The defining characteristic of the most preferable wine for imbibing while viewing epic, come-from-behind NFL playoff battles between hated sports rivals (aside from the wine having been paid for by someone else, that is), would be that the wine is very good without being too good. While a good beer of course fills the NFL playoff imbibing bill quite admirably, sometimes even the most die-hard beer fans, much like the play-calling of hall-of-fame defensive coordinators, just need to change things up once in a while. And it goes without saying that no self-respecting wine geek would stoop to drinking plonk during an NFL playoff game, just as no self-respecting Steelers fan would be caught dead wearing Ravens purple. When it comes to NFL-viewing, distractions (too good or too bad), are killers: missing the big play as it unfolds live, because you have your nose too long in the glass, is likely to give you a gut-wrenching “got to be the sickest man in America” feeling (sort of like a high-priced, free-agent wide receiver dropping the type of key, clutch, do-or-die-time pass for which his team hired him in the first place). You want an Overachiever wine in this circumstance, no doubt about it. First, it needs to be inexpensive enough that buying a few bottles for the crowd gathered at your party to cheer your team on to victory doesn’t break the bank. Next, it needs to be tasty and versatile enough with a wide range of robust game-time snacks and food. And finally – I cannot stress this point enough – it cannot be a mind-blowing wine. When you’re cheering on an epic, heart-stopping 58-yard pass to a rookie wide receiver that sets up a potentially game-winning touchdown run with less than two minutes to go in a win-or-go-home game… well, that is not the time to be pouring Domaine de la Romanée-Conti and waxing philosophic over its mind-boggling nuances, or worrying about spilling expensive juice when you jump up and down cheering (and having to explain to your friends why you are sucking the spilled wine out individual carpet hairs later). 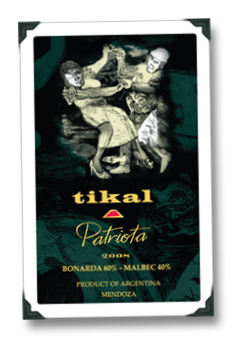 Personally, I found the 2008 Tikal Patriota (a blend of 60% Bonarda and 40% Malbec), at less than $20 and a hair shy of 14% abv, to fit the bill perfectly. While now surpassed in plantings by the near-ubiquitous Malbec, the Piemontese grape [ UPDATE: there is widespread belief that the grape is actually Charbono and NOT Italian – see the Comments ] Bonarda still has a substantial amount of acreage devoted to it in Argentina and production of wines from Bonarda are common enough to be found without too difficult of a search. Its wines can offer up a range of styles from light, peppery-fruity wines to large, tannic, raisiny beasts depending on the age of the vines and the amount of oak used to finish them off. In the case of the 2008 Patriota, it’s somewhere in-between the two styles mentioned above, but clearly leaning towards the latter – there are gobs of red berry fruit, along with fig and plum notes and hints of spices. While it’s a bit over-extracted and has a touch too much oak for my tastes, I was pleasantly surprised at how well it fared with half-time dinner. It also had just enough spicy complexity to keep me occupied during boring commercials mid-game, or during rare moments when the game was in a lull. Times when I wasn’t watching epic plays, for example – you know, when rookie wide receivers weren’t smoking their over-hyped and over-paid defensive counterparts and catching 50+ yard passes from Superbowl-winning quarterbacks using a combination of their fingertips and helmets. p.s. – This wine was sent to me as a press sample, though I can’t for the life of me recall who sent it! Couldn't agree more – great choice. And good alternative to the Australian linebacker-style cliche that would be so easy to suggest. Cheers! :) Thanks, Steve. Did you like how I subtly wove in my NFL sports team allegiance? I bet you can't tell who I want to win this weekend…! Yeah, Steve – I'm understated like that. Here's to a good agme, Cheers! Here's to a good game, indeed! And while I feel sympathy for almost any NFL team that has gone nearly a half-century since its last championship (have to say "almost any" because the Cowboys are, of course, excluded), I'm still gonna be cheering my Stillers on to what I hope will be their unprecedented seventh Lombardi trophy, even if it's only unprecedented compared to themselves since they already have a league-best six championship trophies. to which they replied "fair enough :)"
Good sports! Maybe I'll try that wine later. Hopefully after another Steelers SB victory! I do love Bonarda, and are reviewing one very soon on my blog, from Altos las Hormigas. It is an underappreciated grape, and often can be an excellent value wine for $10 or less. One good thing about Bonarda is that it's often fairly food-friendly & on the inexpensive side, so it makes a good pick for a by-the-glass selection at restaurants that offer it. I have never imagined that I can have a wine in a NFL match. I always preferred beer because I thought wine was inappropriate while watching sports. But now, I'm going to give it a try. GO STEELERS! And wine with football is tricky, but I've done it. Still prefer beer though. :) It is tough to compete with beer for football time – but it IS possible! Cheers and GO STEELERS!!! 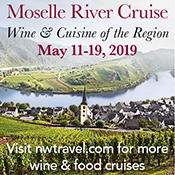 and I will be the first to admit that I do not know too much about wines but this is my opportunity to gain knowledge about something that I have always been curious about. I certainly enjoyed this post of yours because not only have I been a die-hard Steelers fan my entire life, but I love how you found a way to make a post about the best game-day wines. I think that was awesome! 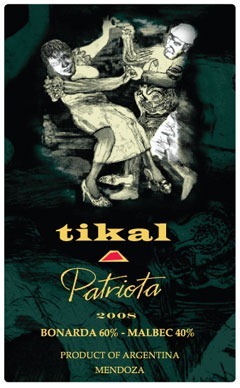 Now I know what I am going to drink for the superbowl! Why not take the game to a classy level and rebel against beer, right? If you want to check out my very beginner blog and offer me suggestions, that would be wonderful! My email is [email protected] thanks so much and I will continue to read your blog! Thanks, collegeandwine – but don't go dumping beer just yet (I love both wine and beer myself! :-). Cheers!